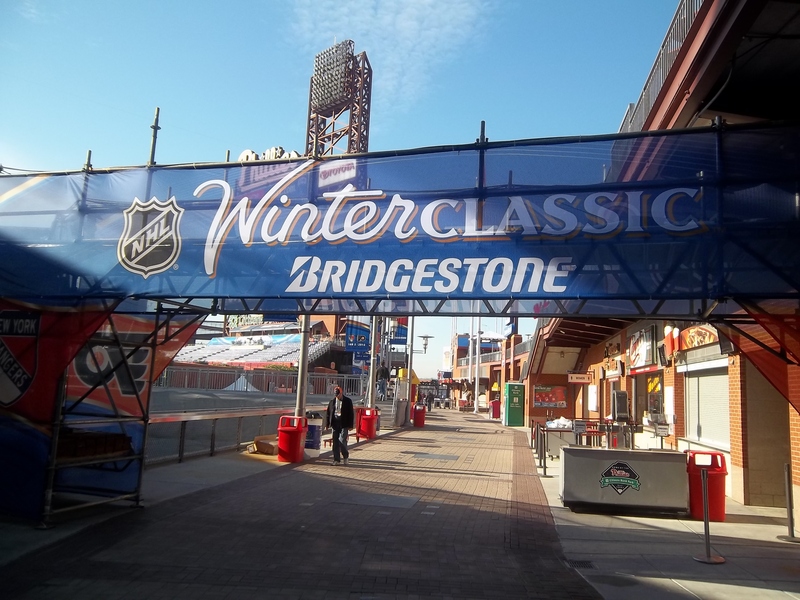 A capacity crowd of 46,967 braved temperatures in the 30s and intermittent snow flurries to see the visiting New York Rangers edge the Flyers 3-2, when the NHL and Bridgestone Winter Classic came to Citizen’s Bank Park, home of baseball’s Philadelphia Phillies. But little did the capacity crowd know what it took to get that ice onto the ground. Weeks of preparation, hard work, and yes, advertising. Advertising? Yep. All over the place. And it’s a brilliant way to cover up scaffolding that might be necessary for the “behind the curtain” workings of an event like this. If you recall, Superior Scaffold wrapped the entire Independence Hall tower in a decorative scrim that would give visitors a rough idea of what the renovated building would look like. And there is really no difference here. 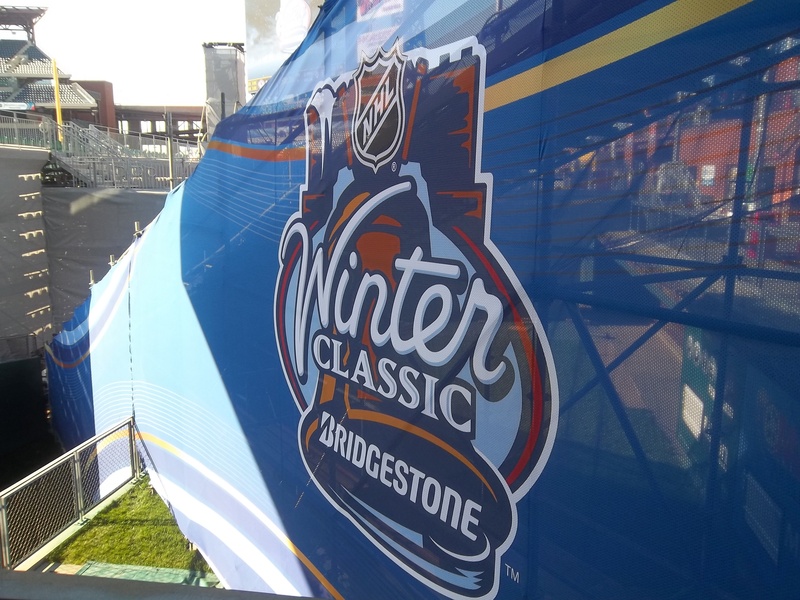 BAAM Productions wanted to promote the NHL and sponsor Bridgestone and used the system scaffold carrying the water and chemicals necessary to create the ice down to the field as their billboard. 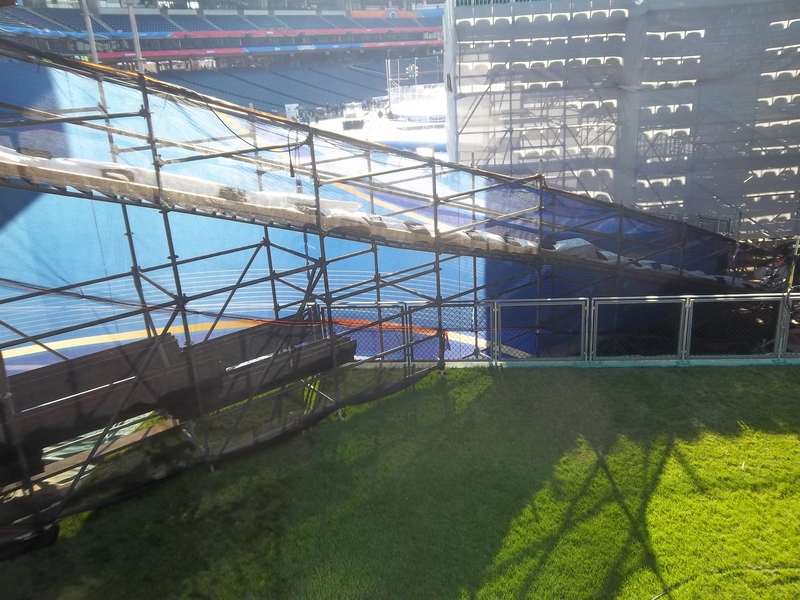 They knew that 46 thousand humans would be walking directly beneath this “Ice Bridge” going to the field, so they put it to good use. Carefully hidden behind these graphics is the scaffolding that supports the real going’s on. It’s just beautifully wrapped in color graphics. 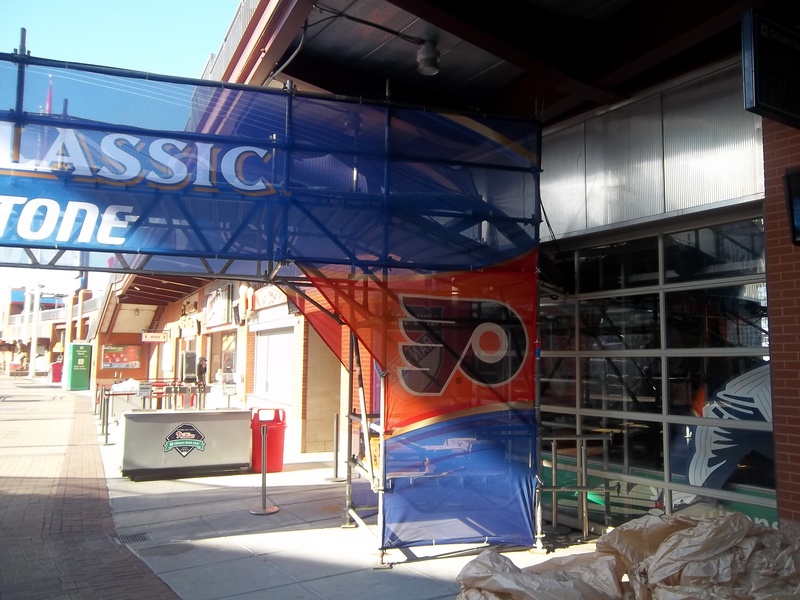 So when you’ve got scaffold being used in public – why not USE IT – for your advertising or promotional needs. It only makes sense. And Superior Scaffold can help you figure out the best way to do that. We can create banners, graphics and scrims to almost any configuration to put onto your scaffold project. 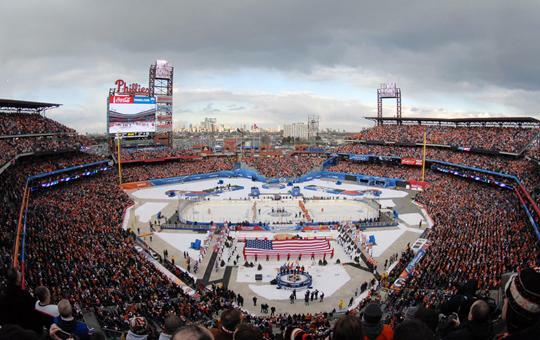 If the NHL and the NPS can do it – why can’t you? This is what the stadium looked like in FULL – Action mode. 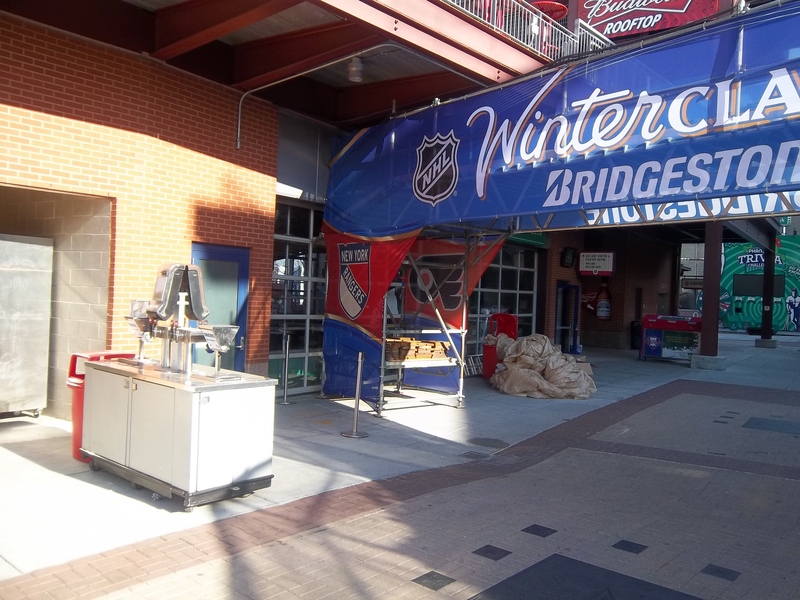 Posted on January 4, 2012, in System and tagged Advertising, article, Baseball, bieber, Billboard, facebook, fans, Flyers, Hockey, lmfao, magazine, Marketing, New York, News, NHL, NJ, NYC, philadelphia, Philly, Press, Rangers, Rental, rentals, scaffold, scaffolding, Stadium, Suspended, System, twitter, youtube. Bookmark the permalink. Leave a comment.